Furtwängler’s Pastoral hasn’t survived in quite as many performances as his Eroica – but it’s still a close-run thing. This wartime Berlin performance was taped in March 1944, which post-dates the 1943 Vienna and predates the post-War examples: Berlin in 1947 and 1954 (twice), Vienna in 1952 – a commercial recording – and the RAI inscription of 1952. With so much to choose from one needs to exercise a discriminating judgement. In point of fact the differences in interpretative standpoint between the conductor’s various performances of the Eroica are on balance more marked than in the case of the Pastoral. With the latter symphony it’s a question more of degree. The conception was, perhaps unusually, relatively static or that’s how it seems on the basis of a decade’s worth of performances. Certainly there is nothing like the level of drama and tension that we find in the wartime Eroica, which one can then contrast with the more classicist instincts of post-War performances. Or indeed the analogous case of Schubert’s Ninth Symphony which in wartime was terrifically volatile and afterwards very much more classical in orientation. 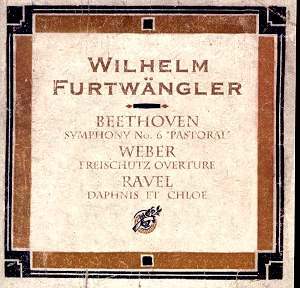 So for Furtwängler perhaps the Pastoral offered less in the way of expressive extremes. That said this is a slightly more toughly hewn performance than the earlier one in Vienna. Dynamics are attended to with convincing energy and subtlety; harmonic points are brought out with consummate structural awareness; note the clarinet pointing in this respect. The finale is notable for the forward-moving excitement that the conductor brings to bear and also the relaxation into Elysian pastures - transitions accomplished with all his accustomed skill. This is assuredly a Pastoral that admirers of the conductor will want, if they don’t already have the relevant DG set devoted to these same wartime broadcast performances. The Weber Freischütz consolidates the desirability of the disc further still. It’s a cracker of a performance of a favoured piece. He’d set it down on early electric 78 in 1926, again in 1935 and then other performances exist from 1952 and 1954. Of course the whole opera was recorded in 1954 as well. This wartime performance is a supremely educative example of Furtwängler’s sheer power. The tensely marshalled accelerandi are magnetic; the dramatic saturation of tone and the stentorian masculine drive are unstoppable. Add to that the eloquent string curve and the splendid wind principals’ solos and you have an overture teeming with brilliance and passion. It’s probably best in this context not to dwell too much on the Ravel. It’s valuable because this is the only example of his Daphnis et Chloé – the Suite No.2 – but it really isn’t idiomatic at all. The sound, that had proved so malleable and powerful for Weber, here proves too congested and thick for Ravel. Nevertheless it’s a collector’s item and part of a fine disc. All this material has been available in DG wartime broadcast sets, as noted, so that might tip the scales when it comes to pricing and other matters.